As a guest of the Lotte New York Palace, not only will you enjoy the Old World opulence of the hotel itself, you’ll also be treated to the many vibrant and venerable cultural attractions that make Midtown Manhattan one of the world’s most iconic locations. 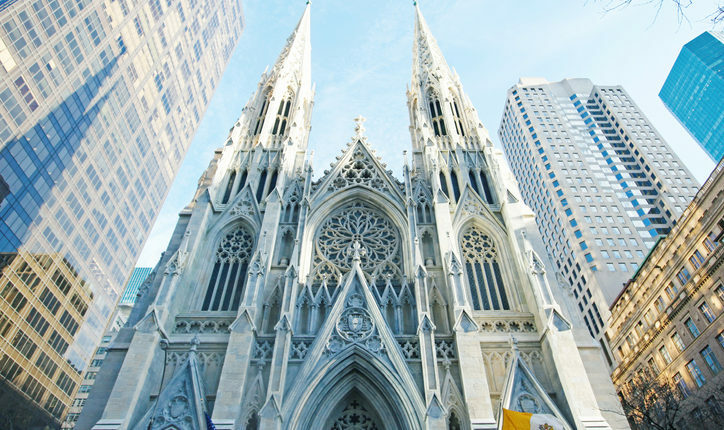 Mere steps from the Lotte, St. Patrick’s Cathedral, the largest Neo-Gothic-style house of worship on the continent, spans an entire city block, with its main entrance on 5th Avenue flanked by a pair of imposing spires that tower nearly 330 feet to the sky. Viewed from the heavens above, the cathedral, like its many European antecedents, is laid out in the shape of a cross, the tip aimed directly at Madison Avenue and our hotel. The interior of the church is just as impressive, with its instantly recognizable rose window and stunning altar designs by Paolo Medici and Tiffany & Company. Stop by or call ahead to find out when public tours will be running during the week of your stay with us, or, if you have a party of ten or more, reserve a private guided tour all your own.